Open 7 days! Monday - Friday 11am to 2am, Sat, Sun Noon to 2am. Kitchen open till close. Check out our Specials page! Day and night time specials - more great reasons to hang out at Renegades! 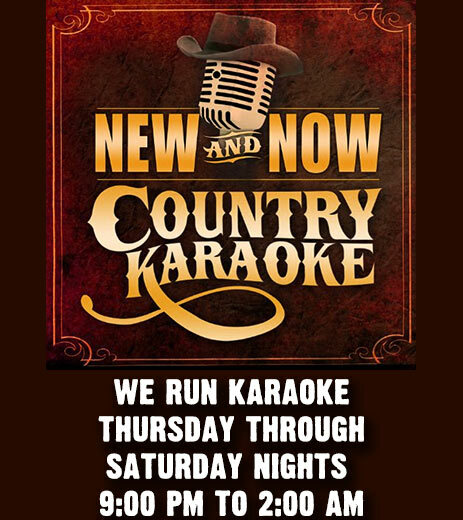 We run Karaoke Thursday through Sunday nights from 9:00 pm to 2:00 am. No Karaoke on Monday, Tuesdays and Wednesdays. We are Renegades Bar & Grill, a Karaoke establishment with a themed interior that sets the mood for singing all your favorite Country and Southern Rock music! We have ongoing daily and nightly specials to help keep more money in your pocket! We have a fantastic food menu and the drinks are always top notch, with a great selection of booze and domestic, import, and craft beers on tap and bottles. So come on out and wet your whistle at what is sure to be your favorite new Karaoke bar and meeting place, Renegades Bar & Grill! Sign up here to receive updates and notifications of specials at Renegades! Each time you visit, you can earn points towards discounts and FREE food! Renegades Bar & Grill is looking for EXPERIENCED Cooks, Part Time Servers, Bartenders, DJ's and KJ's - Interested persons please complete our online application. Copyright ©2015 - 2018 Renegades Bar & Grill. All rights reserved.